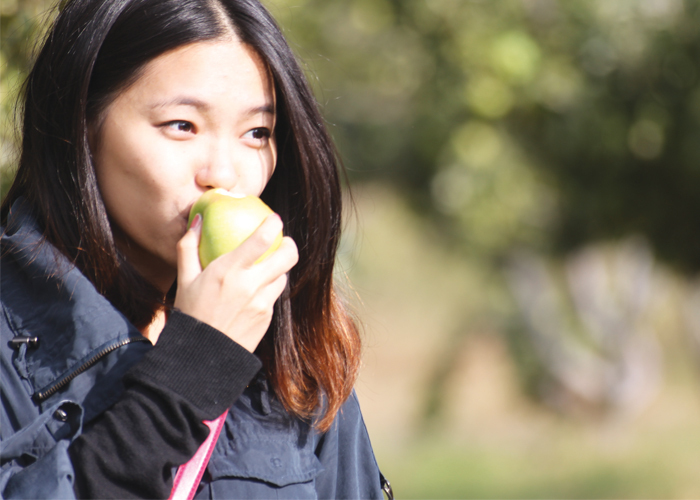 Raymon Narez — Emily Mai travelled with the International Student Center to Los Rios Ranch to pick fresh apples and use them for fresh baked pie filling. A cloudy sky and a soft breeze moves the leaves of all the trees in the orchard. Granny Smith, Golden Delicious and Red Delicious apple trees cover the area, ready to be plucked from the branches. Two vans full of California Baptist University students from the International Student Center made the trip to Los Rios Ranch Oct. 12 in Oak Glen, Calif., located in San Bernadino County. Students, both international and non-international, got the opportunity to pick fresh apples and use them as pie filling later in the day. “Apple picking was fun” said Brylka J. Duvu, a freshmen business major. Some international students have not had the opportunity to take advantage of and explore the nearby areas that surround Riverside. Oak Glen, 35 miles from CBU, is known for the vast apple orchards that cover the landscape. When in season, the tourist attraction allows visitors access to the fresh apples, pies, ciders and restaurants. Joshua Lee Duvall, a junior civil engineering major, is one of six student leaders who set up and participate in events held by the International Student Center. As an off-campus events intern for the ISC, Duvall is involved with coming up with and organizing events that are anywhere off of the CBU campus. “We plan the different events to help the international students adapt to the American culture as well as CBU culture” Duvall said. Wonyung Kim, a freshmen psychology major, said students involved received not only memories, but also insight into future places to visit. “I’d definitely like to go again, with friends and family,” Kim said. The ISC has events planned throughout the semester open to all students. For a list of events visit the International Student Center in Lancer Arms, Room 42.